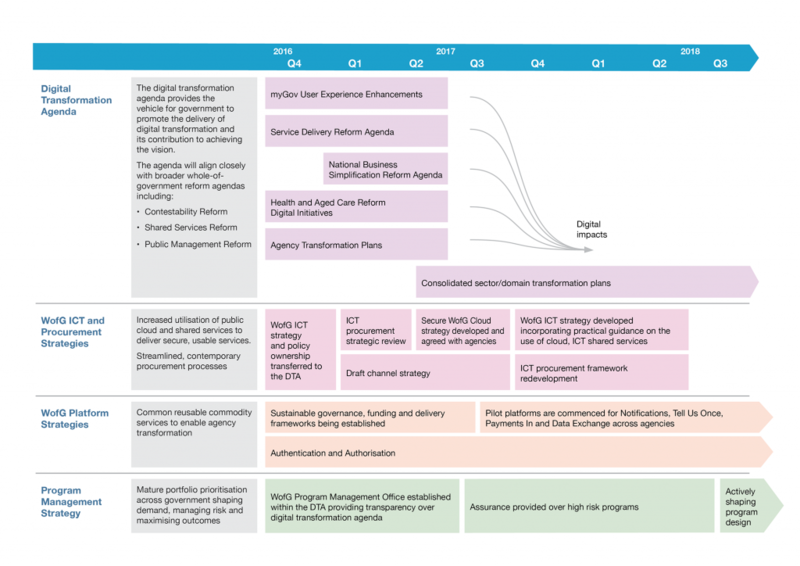 This roadmap provides a clearly signposted route for transforming government digital services. The Digital Transformation Roadmap was created in 2016 and has guided the transformation of government services. Over the coming months, we’ll refresh the roadmap to recognise the progress made so far and to map out the next steps needed to deliver the Digital Transformation Agenda. Consistent with our commitment in this roadmap, we’ve delivered consolidated sector/domain transformation plans. These plans have been developed as roadmaps for businesses and individuals and describe changes to user experiences over time. Read the full text version of this roadmap below. The Digital Transformation Agenda provides the vehicle for government to promote the delivery of digital transformation and its contribution to achieving the vision. Increased utilisation of public cloud and shared services to deliver secure, usable services. Common reusable commodity services to enable agency transformation. Mature portfolio prioritisation across government shaping demand, managing risk and maximising outcomes. Below you will find targets for the roadmap for each quarter between quarter 4 2016 to quarter 3 2018. There are no targets for quarter 4 2017. There are no targets for quarter 1 2018.